Blackberry House blog retail shop projects and painted furniture: Funky Junk's 1000 Follower Giveaway Party - See What I'm Giving! Funky Junk's 1000 Follower Giveaway Party - See What I'm Giving! Welcome to those of you coming over from the Follower's Party at Funky Junk Interiors! If it's your first time here, please kick off your shoes and stay a while. Scan the categories on the sidebar to see what's here that might interest you. Whether you're new here or returning, I'm pleased as punch to have you. If you know Donna at Funky Junk, you already know that her blog is growing by leaps and bounds, and you're probably already following her every move. I know I am. If you don't know Donna, then she's a friend you're gonna wanna make. She's a true DIY gal's gal. - she is the QUEEN! Read a bit of her blog to see what she's all about, and be sure to read about her new Workshop Series. I am an interior designer by trade, but have recently chosen to take a step back from that part of my career to focus on building a business centered on work solutions for the DIY gal. While working in my design business, and particularly in my drapery business, I discovered that it was hard to find some of the working tools that would make my life a bit easier. So, I decided since I was a creative gal and knew how to sew, I could certainly figure out something to make that would put everything I needed during my work day right on my body. This is how my women's work aprons were born. 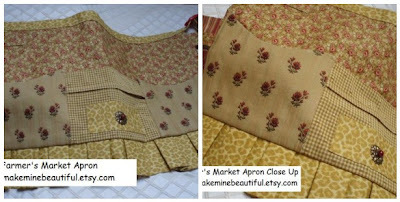 I made several styles of aprons with many kinds of pockets, loops, accessories, etc, trying to create the right design. I wanted these to be perfect since I knew I wanted to market them to other women in my position. I've finally got it. I've got my Etsy apron store open for reatil business now. Please take a few minutes and see what's there. 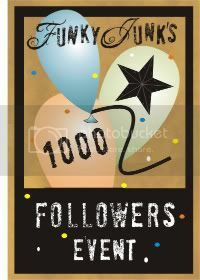 I'm giving you a great prize in honor of Donna's 1000 Follower Giveaway. I'm offering you a choice of the following items in this giveaway. You'll need to go over to Funky Junk and leave a comment on her post starting Friday at 10:00 pm Pacific time. You do not have to be a follower to enter, but you do have to leave a comment. NOTE: The winner will be chosen from comments left over there - NOT here, but I certainly welcome your comments here. First up is the Workroom Apron. The pockets hold many items, and the loops hold your pliers, chalk markers, tape measure, hammer, etc. For those of you like me who need even more pockets than the apron allows, we have accessory pockets that slide on the waistband. (Note: The accessory pockets are not a part of the giveaway - only the apron. For more of the details on this apron, read the post following this one, or go see the description on Etsy. (Selected specifically for this giveaway.) The second is denimn and burlap in case you can't tell. Next up is our very popular Farmer's Market Apron. This apron is perfect for the flea market or tag sale gal or the serious shopper that doesn't want to be bothered with a purse. There is a zippered pocket for safely storing valuables, and a small pocket for your business cards when you need them at the ready. This is a really cute fitting apron. Looks like a skirt when it's on. For those of you who need a full body apron, we have The Everyday Crafter. This apron has 3 large pockets, lined, and an adjustable neck line. This apron also has a name badge that is embellished with the cutest buttons I can find. And finally, if you already have your own craft apron and you just really don't need another - which I can't imagine! - then I'm offering one for the little gal in your life. This is our wildly popular Kid's Craft Apron. It has several pockets to stash all of their goodies, a few slots for markers, and a removable wash cloth for them to clean up their messy spills. 1. You have a choice of 4 different aprons. 2. 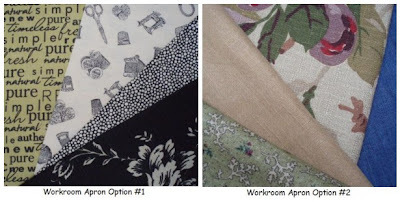 You have specific fabric selections for each apron style. 3. You must go to Funky Junk and leave a comment on her post to be eligible to enter. You do NOT have to have a blog, but you must leave her a way to get in touch with you should you win. 4. You MUST let her know in your comment which apron style you would like to have, and which fabric combination for that style you prefer. 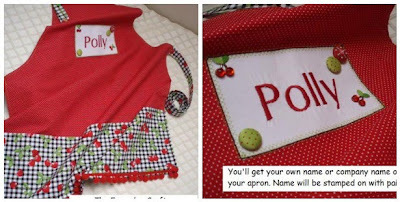 If you choose The Everyday Crafter or the Kid's Craft Apron, let her know the name you'd like to be put on the apron. 5. Winners of her contest will be announced on January 30th. I'd really appreciate it if you'd help me spread the word about my work aprons. I'm fairly new to blogland and could use the word of mouth. 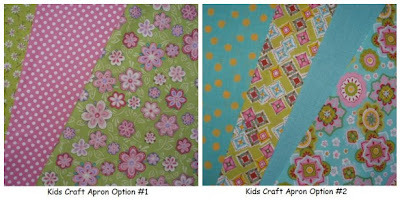 You can see most of my aprons here as well as all of the current fabric combinations available. All aprons are made sturdy for continuous use. If you just have to have one now, go ahead and buy one for yourself, and if you happen to win the giveaway, I'll refund your money. How's that for a good deal? 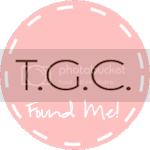 If you like them and share my passion about being able to work smarter, pick up my new button to post to your blog. I'll thank you fo-ev-va! Now run back over and check out all the projects the folks are posting over at Funky Junk's weekly Saturday Night Special. Hope the move is going well, Polly! Love all your selections and you know I love my apron! Keep well! You're aprons are so neat! I was drooling over the first ones... and then the flea market... oh my word! I go thrifting all day long on Fridays in the spring and summer. This would be a dream to have! Glad we got to learn a little more about you. I've been following your blog for a little while, and I think its fantastic. You are super creative, not to mention, talented! Thanks for being one of the sponsors of FJ Donna's big extravaganza, it's been a fun week over there! *I meant Farmer's Market Apron, not flea market! Dur! Thanks so much Polly, for your very kind words AND for opening up this fabulous giveaway in the midst of such a crazy time of life for you. It's only 8:47 pacific time now, so at 10 sharp we'll get the apron show on the road! Whoohoo! Lots of choices so will have to think about what i want before i go over to Donna's. Love these aprons! And the color combo's are terrific. Thanks for sharing your talents with us! I love your work! Thanks for offering the giveaway! Oh Polly, I just love these aprons, it is so hard to pick just one, and the fabric combo are wonderful. I have been visiting you for awhile, but now I am a follower. Also, will add to my blogroll. Thanks for the awesome giveaway. Have a blessed weekend. Your aprons are magnificent! Tough choice! I'm going to wander over to your Etsy store now and see what goodies you have there. I'm a gardener and I think these just might work perfectly for that also...thanks! Wow! Wow again! I love your design and your fabric choices. I can't wait to browse around your blog a bit more. I am not ready to make my choice for the drawing. That will take a bit more thought! Deep happy sighs upon viewing such loveliness! I so could use a new apron. great job! OH MY! Beautiful. First time visiter, am now a follower. New to the blogging community and am thrilled. 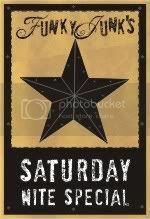 Will be visiting your esty shop soon! you are so talented! thanks for contributing to the giveaway! it is so much fun! Your aprons are gorgeous! Love, love, love 'em! Glad to see you back, Polly. Hope your move went well. You must be settling in to have gotten so much done. 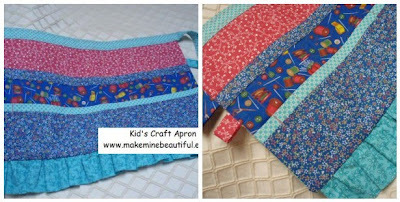 I love all your aprons and will post on Donna's blog for the givaway. Are pictures of your new place in the future? The aprons are so cute and I love the fabric choices. Thanks for this great giveaway! Your aprons are so cute! The fabrics are so fun and your sewing skills are so good!! Your aprons are fabulous!It's hard to pick just one. Workroom Apron in the denim and burlap. Glad to have found another creative "Polly"... I'll be following! How beautiful! I'd have to pick workroom apron #1... but each and everyone is just amazing! Love-love-love them!